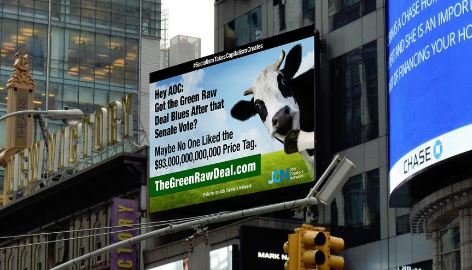 Another giant billboard popped up in New York City Tuesday trolling Democratic New York Rep. Alexandria Ocasio-Cortez after Senate Democrats refused to support her Green New Deal. Democratic New York Gov. Andrew Cuomo and NYC Mayor Bill de Blasio supported the Amazon deal, but many locals protested at stores and hearings, and the city council has badgered company executives about the company’s position on unions. Amazon is moving forward with plans to construct another center in Arlington, Virginia, near the nation’s capital. The project in New York was expected to create 25,000 jobs. A smaller project in Nashville, Tennessee, is expected to create 5,000 new jobs.